I've been loving really simple outfits at the moment. These ripped jamie jeans have been a real style staple in my wardrobe and I'm making sure I really get some good use out of them! (Especially with them being £42!) They're so so comfy and I could easily wear them everyday to University with a pair of white converse! 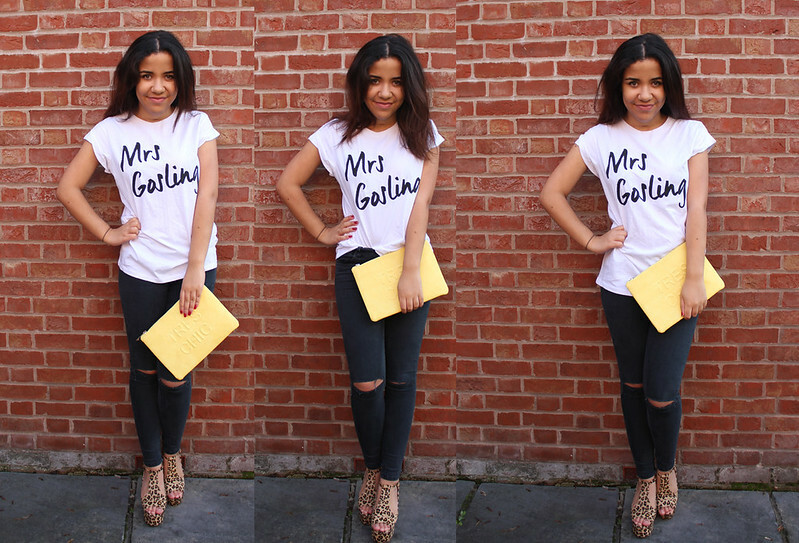 I've teamed these jeans with a new favourite top of mine I just had to have which is this Mrs Gosling T-Shirt! It's so baggy and comfortable I absolutely love it. I love wearing it with midi skirts but also with ripped jeans! I think at the moment accessorising is a great way to transform a day outfit into a night outfit! 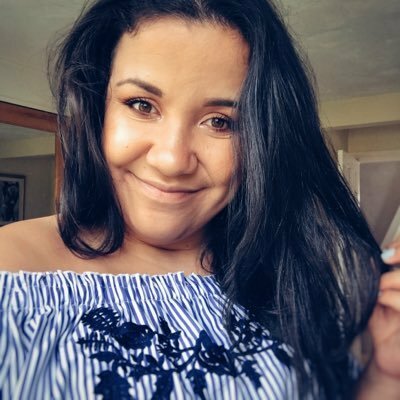 I'd wear this outfit during the day (minus the heels and the clutch bag) with my new leather jacket (which is this one) and a pair of my trusty converse! 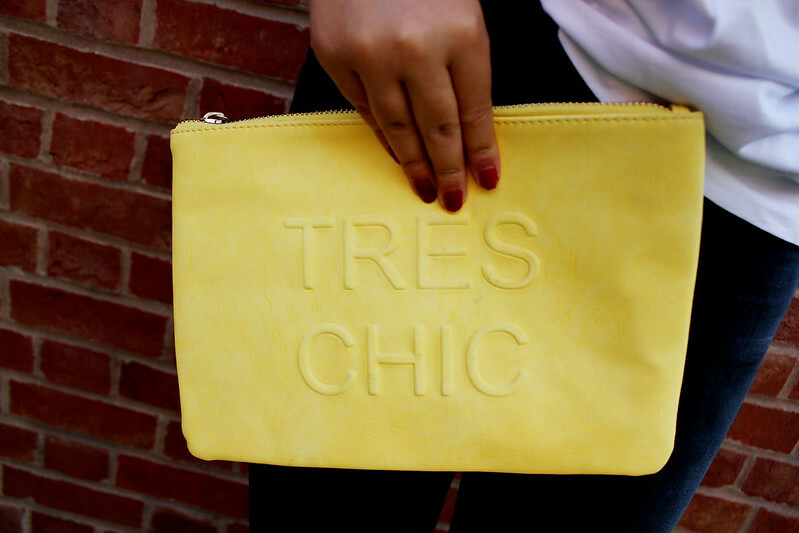 I've been a little bit in love with this 'Tres Chic' clutch since It arrived in the post a few days ago. Oh my god it's amazing! I love how slogans and quirky quotes are everywhere right now and this clutch bag is a real statement piece to jazz up any outfit for this Autumn/Winter! Very cute ! 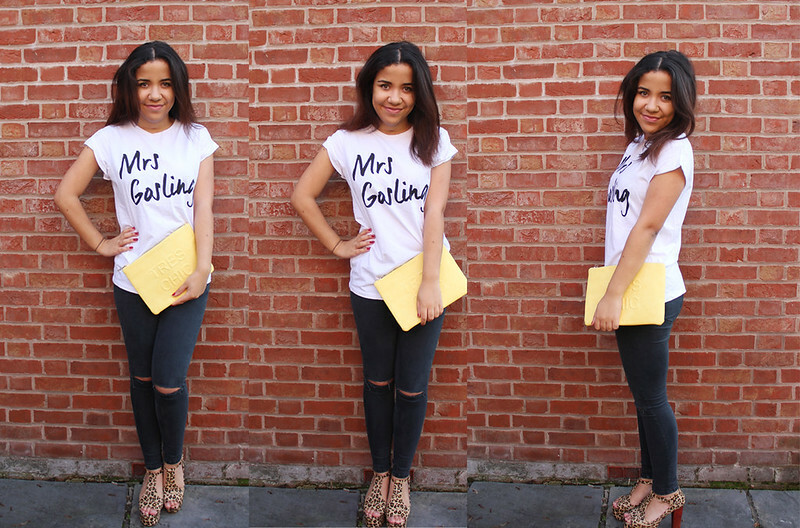 Love the clutch and the denim ! Ohhh my gosh I cannot explain how much I need that tshirt!! I love your jeans! Definitely need a pair like that. beautiful t-shirt! i love ur clutch too, it looks so cute! I'm IN LOVE with your tee! Lovely outfit!